A hiatal hernia, a protrusion of the stomach through the weak diaphragm, is more common than most people think. In fact, some types of Hiatal hernias can either be treated by simple home remedies or aren’t serious enough to be surgically repaired. A Hiatal hernia occurs when the muscle surrounding the stomach has a specific area that for one reason or another, tore or split by the stomach pushing against it. The pressure of the stomach on the large muscle causes the stomach to slowly push through the muscle wall. A hiatal hernia occurs in the large muscle of the stomach inside of the chest. The hole within the muscle is called a hiatus, which is where the stomach pushes through. Quite simply, it is similar to chewing a piece of gum. As your chewing the gum, imagine you poke your tongue through the gum. In comparison to a hiatal hernia, the gum would be the muscle wall and the tongue would be the stomach poking through the muscle wall. A Hiatal hernia is something that starts off so small and sometimes unnoticeable that it rarely causes any problems. If it goes undiscovered or treated, the hiatal hernia symptoms gradually worsen and create negative side effects. In fact, it is rarely discovered when it is in its beginning stages that it usually is only found during a completely random testing for something else by your doctor or during weight loss surgery, known as bariatric surgery. As a hiatal hernia grows, it usually becomes more of a problem. The hernia can cause your food to get clogged in your esophagus or even stomach acid. Hiatal Hernia comes in two main forms. The types of Hiatal hernias are the sliding hiatal hernia (95%) and the paraesophageal hernia, also called PEH Hernia (5%). In sliding hernia, gastroesophageal (GE) junction moves from abdominal cavity to the thoracic cavity. In PEH Hernia, gastroesophageal (GE) junction may or may not move to the thoracic cavity, however, the gastric fundus is protruding through the hiatus. In very rare cases (less than 1%) if a hiatal hernia is ignored, organs like the stomach and possibly the intestines can completely go through the hiatus and turn upside down in the chest cavity. The Sliding Hernia, the most common of the two, occurs where the stomach meets the esophagus within the chest. It is called a sliding hernia because of the upper portion of the stomach “slides” up within the chest. As the sliding hernia presses up to the hiatus, it puts pressure on the muscles that connect the stomach to the esophagus, called the esophageal sphincter. The hernia impacts the esophageal sphincter which starts affecting its ability to stay closed. Negative risks of the sliding hiatal hernia are acid reflux and severe heartburn. PEH Hernia is less common than the Sliding Hernia, although it is not by any means rare. Even though it occurs much less often, it is typically the more serious type of hiatal hernia. The PEH hernia occurs when a hiatus opens up in the muscle, causing the stomach to be pushed through the muscle. If a PEH Hernia is not treated, it can become a life-threatening health risk. The stomach can slowly die to start with the upper stomach that is trapped in the muscle. Type II – About 60% of PEH is type II when the gastroesophageal (GE) junction remains at the diaphragmatic hiatus but gastric fundus herniates through the diaphragmatic hiatus. Type III – About 40% of PEH is type III when both the gastroesophageal (GE) junction and the gastric fundus are herniating through the hiatus. Depending on the severity of the paraesophageal hernia, PEH hernia treatment or repair differs. One of the main surgical methods to remove PEH hernia is laparoscopically. A surgeon will cut a small incision in your chest, or abdomen. A camera will guide the surgeon to the location of the PEH hernia, to understand its severity and removal method. See why Laparoscopic Sleeve Gastrectomy (LSG) and Hiatal Hernia Repairs are common. The surgeon will then insert another tool laparoscopically through the small incision. The tool will pull the stomach away from the muscle wall where the hiatus occurred. The incision hole will then be stitched together as well as the muscle when the PEH hernia was repaired. This ensures that a paraesophageal hernia will never occur again. About 10% of the time, mesh reinforcement is required. Also, the presence of gastroesophageal reflux (GERD) in individuals dictates the need for Nissen Fundoplication. Hiatal hernias are often detected near the diaphragmatic hiatus and repaired during a bariatric operation. 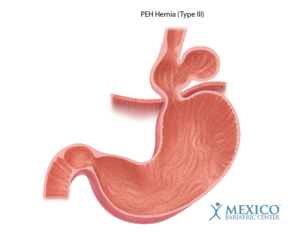 There are reported incidents of increased heartburn after placement of an adjustable gastric band in patients with a hiatal hernia. 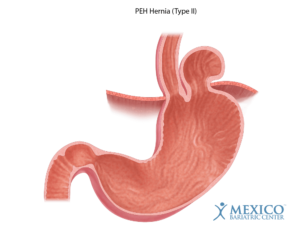 There are also studies suggesting possible benefits of hiatal hernia repair combined with other types of bariatric surgery, such as gastric bypass and sleeve gastrectomy.